Disaster stakes for this talented racer last season when his form took a nose dive, and then he lost his team place with a broken ankle in May. Finished runner-up in the World Junior Final in 1990 at Lvov, USSR, and joined Sheffield in 1993. Refused a work permit 12 months later, but now rides on a British licence after marrying Yorkshire lass Pam Lockwood. His training this winter has taken the form of regular work-outs at Brendan Ingle's boxing gym at Wincobank, where he recently suffered a broken nose. After suffering an injured ankle in a collision with James, and subsequently getting an infection in the wound, Rene was dropped from the team and replaced by Steve Knott in July. Highest scores: Home v Stoke & Glasgow & Berwick (KOCup) 11+1, Away v Stoke (KOCup) 9+1. Born Sheffield, 6th March 1980. A moto-crosser since the age of 10, James attended the Sheffield re-opening with his father in 1991 & caught the speedway bug. His first bike was obtained from Chris Wilson, nephew of the ex-rider and current team manager Reg Wilson. James was thrown in at the deep end making his Premier League debut at Middlesborough on April 4 last year, going on to deputise for Sam Ermolenko on at least one further occasion. A mainstay with the Owlerton Prowlers in the Conference League he finished the season with a 7.37 average. The '97 Premier League campaign saw James struggling with equipment and then losing confidence. With the team struggling he was allowed to join Newcastle on loan in September as the Tigers promoters gambled on Derrol Keats. Highest scores: Home v Berwick (KOCup) 6+2, Away v Berwick (KOCup) 7. Born Louth, Lincolnshire, 4th November 1964. Another schoolboy moto-crosser, Peter spent 12 years road-racing with major trophy successes in both the Isle of Man and Ulster. Spent 1993 flat-racing in America before a belated start on the shale in Sheffield second halves. The last three years have seen him with the Mildenhall Fen Tigers, ultimately as their captain and star rider. Continues to act as instructor at Cadwell Park, Donnington and Brands Hatch, but with two new laydown engines is raring to go this season. Having recovered from a wrist injury sustained at Exeter Peter returned to the track in the victory over Berwick in July. After the meeting he announced his retirement although there is still a chance he may reconsider. Highest scores: Home v Edinburgh (KOCup) 7+2, Away v Newcastle (KOCup) 5+3. Born Ashton-under-Lyne, 26th July 1973. 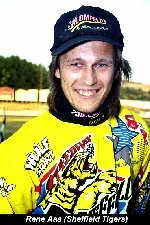 Although Mike has been a Sheffield asset for some time and was called up to cover for injured riders in the 4's rounds, he only officially joined the Tigers line-up in July to replace the retired Peter Boast. His debut against Arena Essex included rearing at the start and landing flat on his back, and stopping to turn on his fuel after leading heat 12 for half a lap! Highest scores: Home v Glasgow (BPL) 7+1, Away v Isle of Wight (BPL) 7. Rode for the Prowlers in '96 and surprisingly joined Berwick at the start of the '97 season. After falling out with their management after a couple of matches he was offered James Birkinshaw's team place in August as the Tigers promoters tried desperately to make the play-offs. Suffered back injuries whilst trying to avoid Phil Morris at Stoke in September. Highest scores: Home v Edinburgh (BPL) 6+2, Away v Isle of Wight (BPL) 4+1. Highest scores: Home v Glasgow (BPL) 18 (max), Away Newport (BPL) 18 (max). Beat Dave Mullet at Reading, 2nd June. Beat Glenn Cunningham at Owlerton, 5th June. Beat Stuart Robson at Owlerton, 12th June. Lost to Neil Collins at Glasgow, 13th June. Born Nocton Hall, Lincolnshire, 29th March 1975. Ex Sheffield junior, Steve moved to Cradley at the start of the '95 Premier League season where he joined Scott Smith, Billy Hamill and Greg Hancock. He found the pace rather hectic and was dropped from the team mid-season, since when he has been on the sidelines. Invited down to Owlerton for a post meeting trial he found himself being offered a team place within days. Made his debut against Arena Essex in July picking up 5 hard earned points despite being mounted on a 2 year old Jawa upright. Highest scores: Home v Glasgow (BPL) 11+1, Away v Oxford (BPL) 8. Lost to Stuart Robson at Hull, 6th August. The Polish international with the dark, smouldering looks of a Hollywood film idol was earmarked for a team place at Owlerton during the winter unitl a transfer from last year's champions Unio Lezno to Jag Lodz in Poland ruled out the move due to fixture clashes. Adam would have joined the Tigers in August until increased wage demands by the rider at the 11th hour were rejected by the Tigers management. Twice a World U21 finalist he also finished runner-up to Slammer Drabik with 13 points in the Polish Individual final at Warsaw last year. Having failed to qualify for the '97 Polish final he will not qualify for a work permit in 1998. Fastest time at Owlerton in '97: yet to ride. Local lad Scott graduated from being the team mascot in the mid-eighties, to a full member of the Sheffield junior team. He moved to the Belle Vue junior side when Sheffield closed in 1989, and joined Div.1 Cradley in 1991. British U21 champion in 1992 he returned to the Tigers lair last season when his spectacular and flamboyant form notched him a 6.23 average. Scott has raced to several home maximums this year, but it is the style in which he scores them that endears him to the Owlerton supporters. Even when left at the start Scott never gives in and last to first dashes are commonplace. Doug Wyer once said, "No-one goes to the bathroom when I'm at the tapes", and the same must be said of 'Scud'. Highest scores: Home v Glasgow (BPL) 15+2, Away v Stoke (BPL) 14. Beat Les Collins at Stoke, 14th September. Beat Shaun Tacey at Owlerton, 18th September. Born Teterow, East Germany, 3rd June 1976.